Statements of responsibility: Most photograph prints copied in negative were produced by Devine. 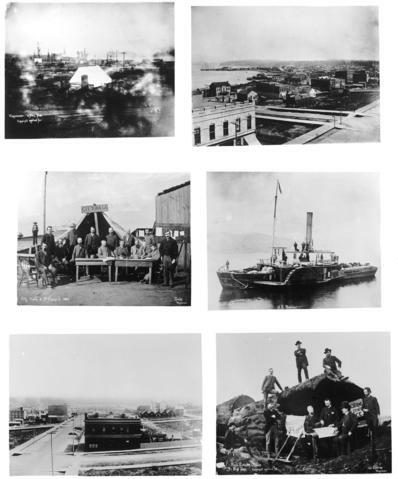 Photograph negative is a copy of six photograph prints, showing: tents erected after fire of 1886; buildings along Vancouver waterfront; Vancouver City Council members and officials gathered in front of tent labelled "City Hall"; men with supplies and oxen on the S.S. "Beaver"; view of buildings and empty lots on street; and a group of men assembled around a large log for an advertisement promoting the sale of Vancouver real estate. Part of negative covered with red masking medium.